For the month of August we are reading and discussing Wĭthûr Wē, a science fiction novel influenced by anarcho-capitalism and Austrian School economics, written by our own Matthew Alexander. Centuries hence, Man, seemingly alone in the universe, slowly spreads his civilizations across his corner of the galaxy. Tyrants vie for power, and in their fierce grip the colonies of the Milky Way are suffocating. In this society of many billions, a young marine, a highly trained war hero, returns home from his tour of duty. Physically powerful yet shy, awkward and unable to sway the masses with pretty speeches, Alistair Ashley 3nn makes a decision to strike at the hierarchy the only way he can. His decision starts him on a grand adventure, and as he is carried along by forces beyond his control, he comes to confront an ancient secret, one which may reveal humanity’s future. You can get a free PDF copy at the author’s website. 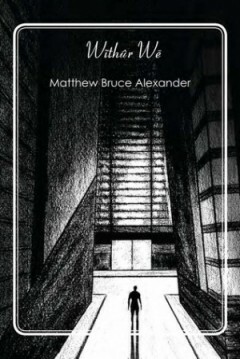 The book can be purchased for Kindle or in trade paperback at Amazon.com. Your purchase via our affiliate links will help support both Matthew’s writing and our work here at Prometheus Unbound. Join us as we read and discuss Wĭthûr Wē. You need not have voted on this month’s selection to join in the discussion, but you do need to be registered and logged in on this site to access the book club’s dedicated forums. Last month we gave away free Kindle (mobi) copies of Wĭthûr Wē in exchange for signing up for our email newsletter. We think the campaign was a big success. We attracted more than 80 new subscribers, more than quintupling our mailing list, and gave away at least that many copies of Matthew’s novel. Congratulations to Garret Myhan, the winner of a signed paper copy of Wĭthûr Wē. Thank you to all of our new subscribers and those who helped promote this campaign. We hope you all enjoy reading Wĭthûr Wē and the content we provide here at Prometheus Unbound. Please join us in the Lightmonthly Read forum to read and discuss Matthew’s novel. And don’t forget the live author chat with Matthew, via Google+ Hangouts on Air, coming up on August 26th at 4 PM EST. We hope work with other authors to give away more books in the future. Authors, if you are interested in collaborating with us to promote your work, check out our Wĭthûr Wē giveaway campaign and contact us. Last month, we read Snuff by Terry Pratchett. There seemed to be a mix of opinions. The writing was clever, but the pacing affected readers in different ways. I felt that it took too long to get started, breaking a promise to the reader made at the very beginning. The slow build up was well done, according to Matthew, but when the story did get under way it did not take off like it needed to, especially after such a long preamble. It was agreed upon that the hook that brought the protagonist into the plot strained credulity. Pratchett tells the reader repeatedly in the beginning of the novel through the protagonist that something was setting off his Spidey-sense … er, crime-dar … but we were never actually shown anything that might be the culprit. Once again, Matthew thought the libertarianism in this nominee for a libertarian award was a little difficult to find. The story is mainly about fighting bigotry, which fits in well with libertarianism but is not essentially libertarian. A comment about a person having the right to put what they want in their own bodies is somewhat counterbalanced by yet another portrayal of a heartless business owner underpaying his labor. To play Devil’s Advocate, the goblins in the story are not merely facing social discrimination stemming from bigotry against their race. They are treated differently in the eyes of the law, making it easier for humans to abuse them, enslave them, and kill them. They are treated as little more than vermin by most. This legal inequality ultimately goes back to a lack of respect for the goblins’ equal rights to liberty and property, which is very much a libertarian concern. I also didn’t have such a negative reaction to Pratchett’s portrayal of the “heartless” business owner. As the businessman himself makes clear, while he is underpaying his goblin labor, at least he’s willing to hire them. No one else will. If more people were able to overcome their prejudices and hire goblins, their labor would be in greater demand and there would be increasing pressure to pay them equal wages. In the meantime, the “heartless” business owner is a benefactor to some goblins and has an advantage over his competition. Market forces can help erode bigotry by penalizing it, but I think it would take a more purposeful voluntary campaign of moral education and suasion (but not government laws and regulations) to really eradicate it. All in all, there was less agreement on this book than with the others, though good qualities were found by all. Check out the full review by Matthew. Discussion has been moved to the TLR — Previous Reads forum if you have more to say about it. If you want a say in what we will read next month, head on over to September 2012 Nominations thread in the book selection forum and put in a nomination. Deadline for nominations is Friday, August 10th. Then voting will be open on the nominees until Monday, August 20th, when the winner will be determined. Do you want to receive the results of the nomination and voting processes in your inbox every month so that you don’t have to remember to check the forum on a certain date? Are you so busy that you sometimes forget when the voting process starts for our next read? If so, then you’ll want to sign up for our email newsletter. We used to post these updates and reminders directly on our site, but now we send them via email instead — typically on the 11th and 21st of every month. We’ll continue to post more frequent reminders on the major social networks, but there’s no guarantee you won’t miss those. For up-to-date information about our book club, you can always visit the Lightmonthly Read page.